A confluence of factors is driving radical shifts in U.S. energy policy, technology, and infrastructure. It is a national imperative to support transformative initiatives, resulting in a more cost effective and sustainable energy system that increases the country’s use of renewable energy sources and energy efficiency at all levels. Over half of the country’s energy use is by citizens in their homes. We must better understand energy utilization and management from the perspective of the residential user to design new systems solutions that provide consumers with the tools to better manage energy usage at home. Create a real world laboratory for systemic experimentation, where solutions, services, and business models can be developed and tested within an integrated, and functional home energy system. Explore and test new solutions for improving the energy efficiency and energy management experience of residential customers. Understand the human factors most relevant to the purchase, installation, and use of energy efficiency and energy management solutions and systems. Leverage the Lab as a mechanism for exploring new collaborations across both the public and private sector. Establish an ongoing platform for experimentation that reflects evolving customer needs and emerging market opportunities. Mobilize systems change with aggressive multi-channel storytelling and network building, leveraging BIF’s open innovation platform and SFIP’s network of cross-sector collaborators and partners. 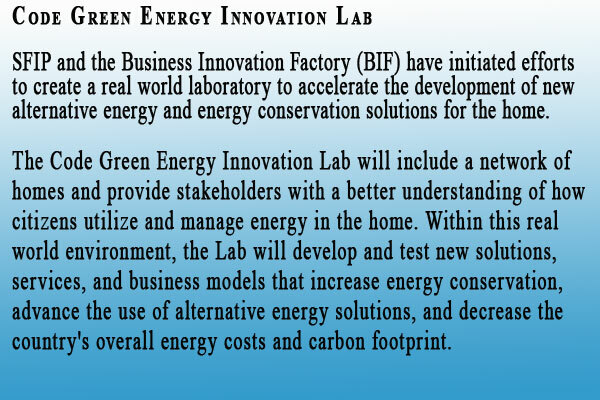 To launch the Code Green Energy Innovation Lab, BIF/SFIP proposes an initial phase of work that will establish a strong foundation of knowledge around user experience and attitudes about energy management solutions in residential environments. The partnership will use these foundational insights to create a functional Laboratory environment and generate a prioritized list of innovation opportunities to be further developed and tested within the Lab, build broad visibility for the Lab and enable systems change. BIF and SFIP see an immediate opportunity to use their complementary approaches in partnership to establish an experience Lab in the energy management and green energy space.